This striking drawing, titled Altar Mensa for the Borghese Chapel in the Santa Maria Maggiore, is by a lesser known but influential architect, Mario Asprucci the Younger. Using water color paint to achieve vibrant illustrations of various, colored marbles and metals, Asprucci captures the architecture’s sumptuous materials and allegorical themes. The Borghese Chapel was originally built in 1605 at the request of Pope Paul V, a member of the aristocratic Borghese family, to house several significant Catholic objects: the icon of the Salus Populi Romani, several relics, and the tombs of Paul V and his papal predecessor, Clement VIII. The pope envisioned the chapel as a memorial shrine; a magnificent chamber that would echo the financial and symbolic values of these important holdings. Although the altar table depicted in this drawing is almost identical to the chapel’s existing table, documents from the chapel’s construction reveal that this table was not actually part of the original design. The Vatican discloses that the table was donated to the chapel by Princess Agnese Colonna Borghese in 1759, forty years before Asprucci’s drawing. The table resembles a Roman sarcophagus because of its luxurious materials, low rectangular shape and placement against a wall. Roman sarcophagi were often decorated only on the front and two sides, and the Borghese Chapel’s altar table is similarly adorned. The face of the object features two gilded emblems with family coats of arms: The Colonna column and the Borghese eagle and dragon. Two lion head handles are mounted atop fixed balusters and at the very center, gilded palm fronds surround a cross. These motifs are classical visual icons; the palm fronds are a symbol of victory, and lions are figures of courage and monarchy. Sculpted out of luxurious stones like porphyry, lapis lazuli, and jasper, the table visually emphasizes the prestige of the chapel and its opulent patrons. To emphasize this point, Asprucci expertly uses watercolor paints to differentiate subtle color irregularities and luminescence of the stones. 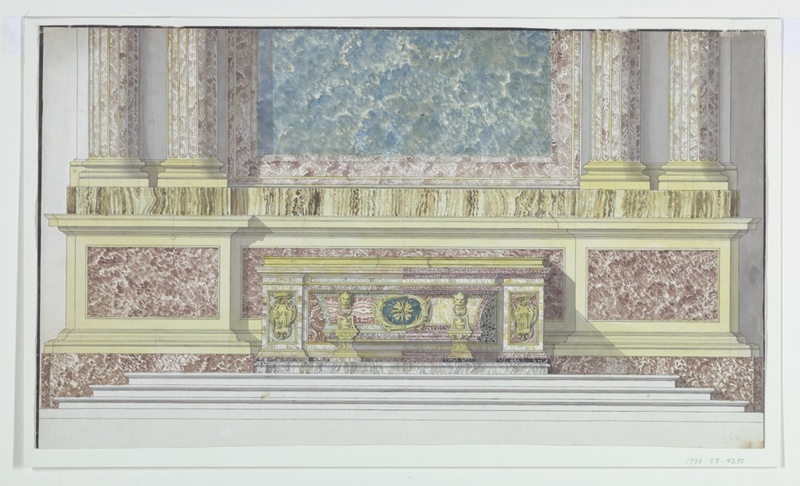 In this drawing, Asprucci offers several marble options for the table’s construction, suggesting that the object was a presentation drawing to show a patron. However, because there is little documentation about the donation of the table, it is difficult to discern whether Asprucci was responsible for the object’s final design. On account of the discrepancy between the pledge of the table and the date of Asprucci’s illustration, historians speculate that Agnese Colonna Borghese’s son, Marcantonio IV, may have commissioned the decoration of the table in honor of his parents. It is also possible that Asprucci produced this theoretical drawing as a visual demonstration of his artistic faculties and sophisticated hand. “The Borghese Chapel,” The Papal Basilica Santa Maria Maggiore, accessed January 30, 2017, http://www.vatican.va/various/basiliche/sm_maggiore/en/storia/cappella_borghese.htm. “The Borghese Chapel,” The Papal Basilica Santa Maria Maggiore.